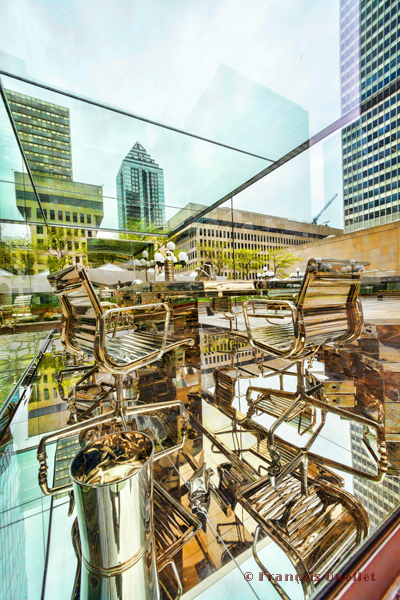 An outside exhibition presenting metal office furniture installed in a glass cage allowed me to show Montreal under an unusual angle. The picture was then digitally treated to give it the desired look. A Boeing 737 800 on final for the Toronto international airport. A Boeing 737-800 is on final for runway 05 at the Toronto international airport. 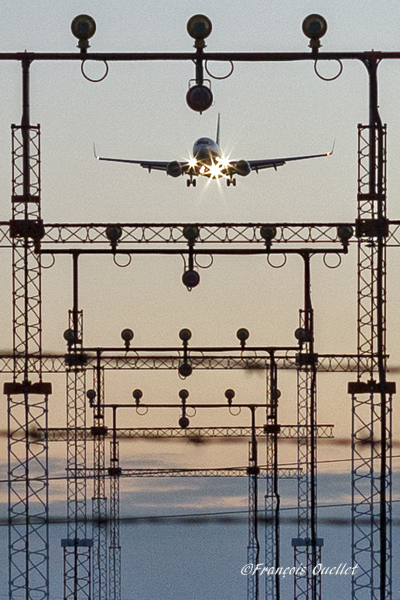 The picture above shows a Boeing 737 800 on approach for runway 05 at the Toronto international airport. I used the precision approach equipment at the threshold of runway 05 to frame the aircraft on approach. A few trials were required to ensure that an aircraft of that size would not seem to be touching the antennas with its wings. At the same time, the rapidly moving Boeing had to stay in focus. The picture was taken in February by -20C. The ambiant light is always softer at this time of the year. For this hand held photo, I used a Canon EF 50mm f/1.4 USM lens. 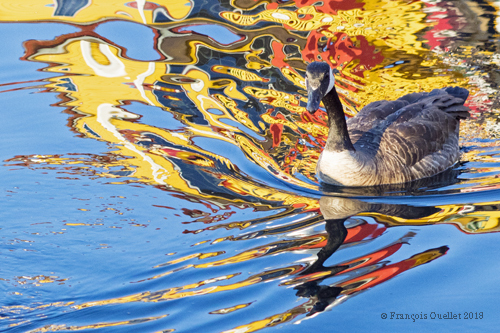 Psychedelic reflections and a Canada Goose. Psychedelic colours surrounding a Canada Goose. The main subject, in the picture above, can either be the Canada Goose or the bright psychedelic pattern of colours surrounding the bird. Moments before three geese swam near Victoria’s Fishermen’s Wharf, in British Columbia, the multicolored houses built along the piers were perfectly reflected in the water. As the geese swam through the reflections, waves and patterns of multiple colours were suddenly created. I chose to take a picture of the last Canada Goose as she benefitted the most from the interesting shapes and colours in the water. The very bright colours were due to the paint chosen for the houses as well as the direct sunrays striking the houses since the sun that was approching the horizon. The goose is positioned according to the rule of thirds, but this is never mandatory. The small waves in the lower left quadrant gradually lead the eye to the main subject. Flight simulation : three screen captures. The virtual sceneries shown below were used for flight simulation exercises. They are all available online, for sale or free, at ORBX ( https://orbxdirect.com/ ). Piper Pacer approaching the dock at Robert’s Lake in Ontario, Canada. In the scenery above, the red Piper Pacer, which is made by Lionheart Creations Ltd ( http://www.lionheartcreations.com/ ), arrives at a Pier at Robert’s Lake, in Canada. 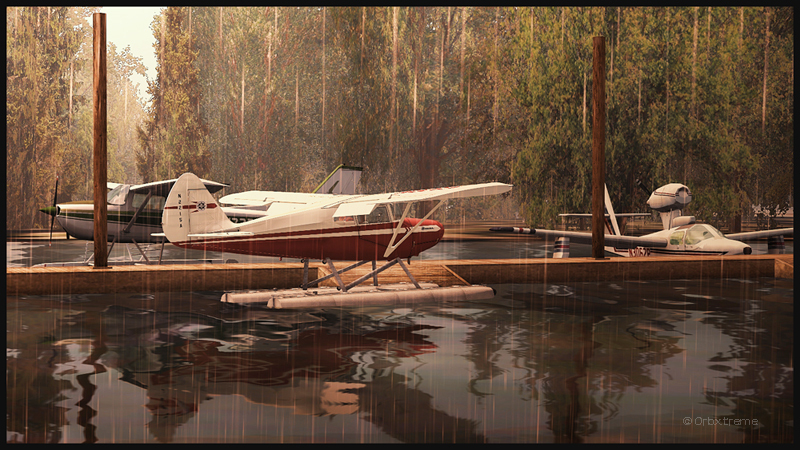 This lake was modelized jointly with the Parry Sound (CNK4) virtual scenery. Virtual Cessna C188B Agtruck near Claresholm Industrial Park in Alberta, Canada. In the picture above, a virtual Cessna C188B Agtruck created by the Alabeo company ( https://www.alabeo.com/sitealabeo/ ) is parked near the Claresholm Industrial Park (CEJ4), in Canada. The virtual airport is available for free download at ORBX. Who said that nothing in life is free?! 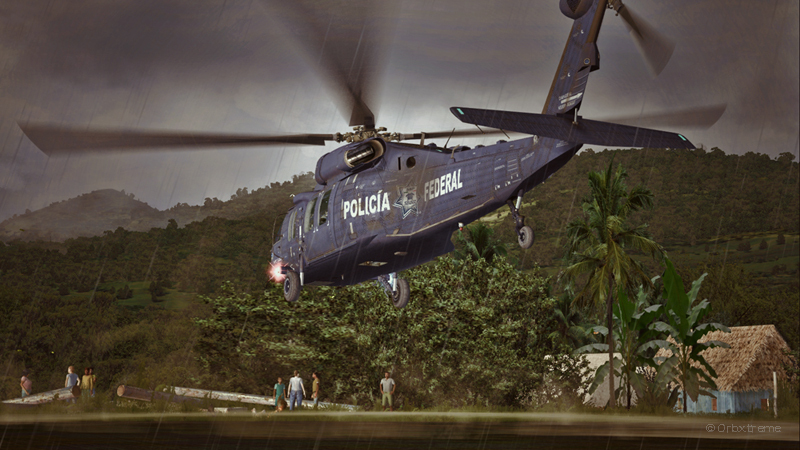 A virtual UH-60L Black Hawk belonging to the Columbian Police Force is hovering in the jungle. Above, a UH-60L Black Hawk virtual helicopter created by the Cerasim company ( https://www.cerasimaircraft.com/ ) is flying over the Papua New Guinea territory. It should normally be hovering over Columbia, but the ORBX company has not yet developed very well defined airports for that country. It was more interesting to fly over an area that was already well modelized. The three screen captures were slightly digitally improved following each virtual flight. The FSX flight simulation platform, although still interesting, is getting a bit old. The original screen captures often benefit from additional digital processing, especially when it comes to posting for the international contest held monthly by the ORBX company. The Château Lake Louise and Mount Richardson. A view of Château Lac Louise and the surrounding mountains. 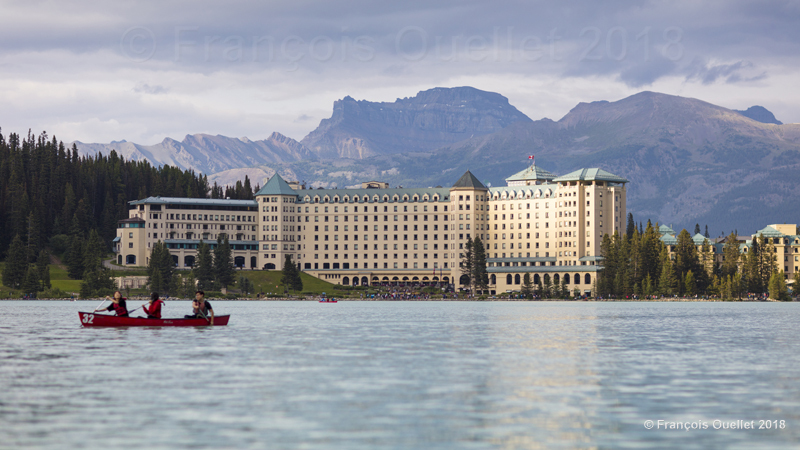 The picture above shows Château Lake Louise and, in the background, Mount Richardson. Lake Louise is in Alberta but only a few kilometers from British Columbia. This picture was taken during summer 2018 while several forest fires were raging in western Canada. Luckily for us, the smoke had not yet reached Lake Louise when the picture was taken. A few days later, the visibilty worsened and the air quality in the area degraded considerably. At the time of the picture, the sky was cloudy and I had to wait for the sky to clear in order for more intense sunrays to light part of Château Lake Louise. This provided a greater contrast between the hotel and the mountains in the background. I thought it was appropriate to keep the canoe with its passengers to add dynamism to the scenery. The photographic composition was planned so as to include the reflection of the bright part of the hotel on the lake. In order to make an acceptable picture at this time of the day while sitting in a canoe, I used a Canon EF85mm f/1.2L II USM lens mounted on a Canon 5DSR camera. The outstanding performance of the lens in low light allowed me to keep the ISO at 200, thus limiting the photographic grain. The shutter speed was adjusted to 1/5000 to compensate for the movement of my canoe and the effect of the wind. It seemed to me that for this particular landscape picture, a 16 x 9 format was better suited than the traditional 3X2 associated with full frame sensors. A partial view of Lake Agnes, Alberta 2018. The picture above, taken in 2018, shows a partial view of Lake Agnes. The photographic composition is limited to elements that reinforce the diagonal lines crossing the scenery. In the foreground, the branch reinforces this composition by following the reflection of the rocks in the water. The limited number of colours in the picture allows for a better view of the diagonal lines in the landscape. 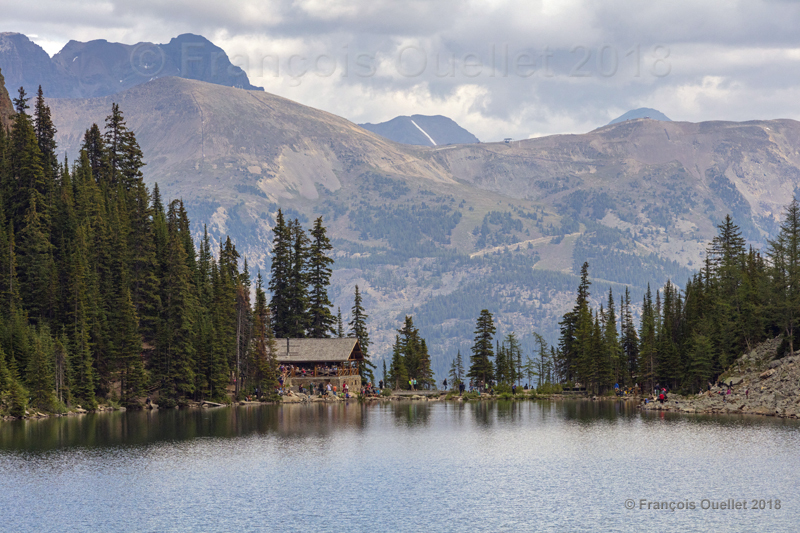 At the extreme right in the foreground are a few people following a pathway along Lake Agnes in order to start the ascent of the Devil’s Thumb (visible in the background) or the more popular Big Beehive. The picture was taken with a Canon 5DSR camera equipped with a Canon EF 70-200mm f/2.8L IS II USM telephoto lens. The Lake Agnes Tea House, in Alberta. A view of the Lake Agnes Tea House, Alberta 2018. The Lake Agnes Tea House can be reached by a very well maintained 3.5 km pathway that starts outside the Château Lake Louise. The climb is only 400 meters (1300 feet). 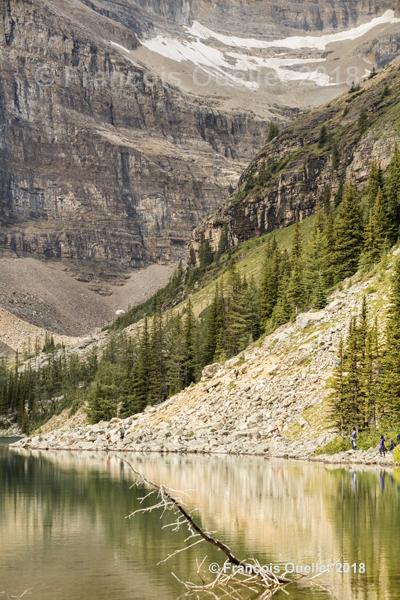 Lake Agnes is located at an altitude of 2134 meters. From there, it is possible to continue the ascent up to the Big Beehive, which tops at 2270 meters. No road allows an access by car to the Lake Agnes Tea House. This means that a part of the products needed for the tea house have to be brought up by foot by employees. The garbage is disposed in the same way, when employees go down the mountain. Customers can help by bringing down a little bag of garbage when they are ready to head back to their hotel. That eases the employee’s task. The tea house menu offers only a few choices, since there is no electricity. But the experience is always interesting. The picture above was taken during summer 2018 with a Canon 5DSR camera equipped with a Canon EF70-200mm f/2.8L IS II USM telephoto lens. The focal length was adjusted to 200mm and the ISO to 2500 for this photo taken with a hand held camera. 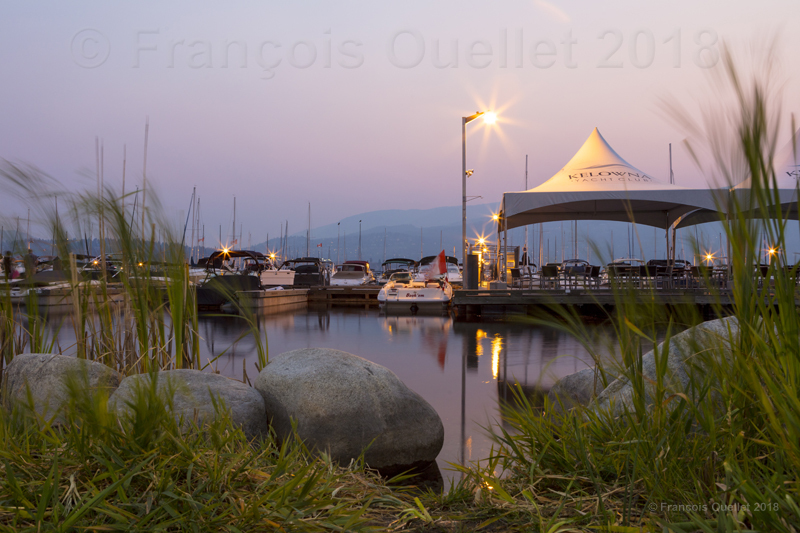 A picture of the Kelowna Yacht Club at dusk. The Kelowna Yacht Club in British Columbia. For this picture of the Kelowna Yacht Club, in British Columbia, I was more interested in capturing the general atmosphere rather than the whole yacht club with all its boats and installations. The words Kelowna Yacht Club and the boats being obvious in the midground, there was no need to add more details. It was nonetheless important to position the tent in the superior right corner of the picture since the name of the yacht club was showing and it was well lighted. The photographic composition includes elements of the surrounding natural environment that made Kelowna’s reputation. The boats are framed between the rocks and the plants in the foreground while the mountains are visible in the background. In order to achieve a good photo at this time of the day, a tripod was necessary. It was nonetheless mandatory to limit the exposure time due to the winds, in order to avoid a blurred picture. The shutter speed was limited to 3.2 seconds and the ISO adjusted to 320 to limit the photographic grain. An aperture set at 13 allowed a sufficient depth of field to offer a sharp image. A Canon EF 24-70mm f/2.8L USM lens mounted on a full frame Canon 5DSR was used for the picture. The focal was limited to 32mm. The visibility was somewhat limited due to the active forest fires in the region, but the additional condensation nucleis in the air helped to obtain beautiful colors in the sky. 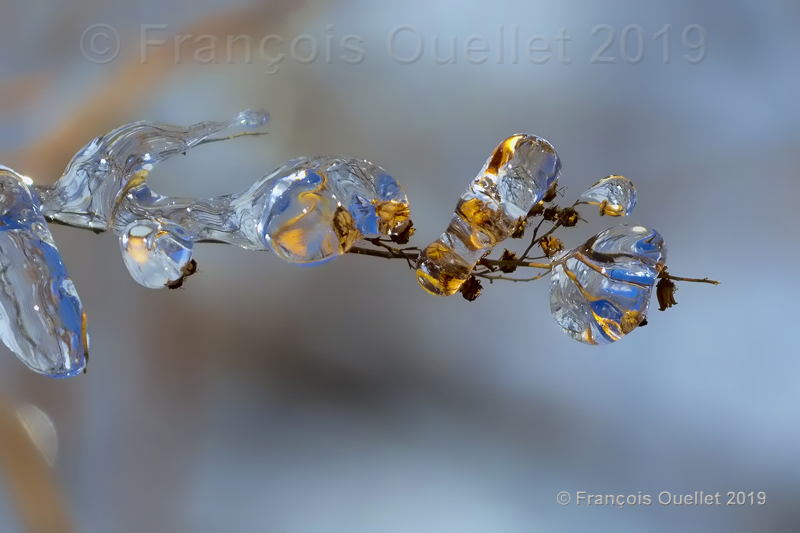 Freezing rain and nature during the winter 2019 in Quebec City. The effects of the freezing rain that fell over Quebec City this winter were not only negative. Photographers seized the opportunity to immortalize rapidly changing situations. In the picture above, the “blue” that is visible in the ice represents the reflection from the magnificent winter sky. On a bigger screen, the ice shows the white birch trees that were surrounding the scene. In order to avoid any distractions, the background was kept blurred by setting the aperture to 3.5. The presence of moderate wind required a higher shutter speed, in this case 1/6400. The ISO was limited to 250, to protect the quality of the picture during the enlargment. The 50.6 megapixel full frame sensor offered all the necessary flexibility during the digital processing. The picture was taken with a Canon 5DSR equipped with a Canon EF 70-200mm f/2.8L II USM telephoto lens. I only had that lens at the moment of my walk. The focal length was 200mm with the stabilizer “on” and a setting of “1.2 meter/infinite” instead of the usual “2.5 meters / infinite”. A summer evening near the Columbia River in Revelstoke, British Columbia. A view of the Columbia river near Revelstoke, Alberta 2018. While passing by Revelstoke, in British Columbia,walking along the pathways near Columbia River is a must. The surrounding mountains offer a very interesting view and the changing colors provide great photo opportunities. In the picture above, I thought appropriate to add a touch of life by waiting for a duck to reach the center of the frame and by including the two bikes in the foreground. Since I was not walking with a tripod, I adjusted the shutter speed to 1/250 and the ISO to 2000. The aperture was set to 9.0 and the exposure modified to + 1/3 to compensate for a bright background. The 50.6 megapixel RAW file allowed for further adjustments with Photoshop. A Canon 5DSR full frame camera was used, coupled with a Canon EF 24-70mm f/2.8L USM lens. The chosen focal length was 70mm.